Long before the Declaration of Independence documented our God given right to the pursuit of happiness, ancient philosophers such as Socrates and Plato wrestled with the question of whether or not happiness was something that every human could obtain. Nonetheless, the conversations about happiness remained purely philosophical for hundreds of years. Fast forward to today when people like Martin Seligman, the father of Positive Psychology, are committed to creating a network of neuroscience researchers who can provide empirical data to support the actual science of happiness. Forgotten in this this long lineage of happiness experts, however, is none other than Rudolph the Red Nosed Reindeer. After studying for years under the tutelage of perhaps the happiest man alive, Santa, Rudolph is rarely recognized for his contributions to the happiness movement. While most would assume that he struggled mightily with negative emotions as a result of his awkward nose, Rudolph was quite well adjusted. After several years of guiding Santa’s sleigh and observing his countless happiness habits, Rudolph began to hold empowerment workshops for the other reindeer. While there isn’t any hard data to prove it, Rudolph’s impact on the reindeers’ performance was remarkable. Following these workshops, Santa noted much less complaining amongst the crew. In addition, he applauded the reindeer for their collective effort to practice daily gratitude and random acts of kindness. 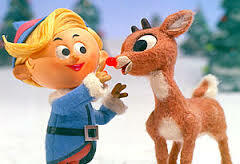 A central theme in Rudolph’s teachings was the fundamental belief that everyone had access to happiness. He taught that it wasn’t somewhere out there, but rather it was inside each of us. It was simply a matter of choice. Below is a special song that Rudolph wrote himself, in hopes of inspiring future reindeer (or people). You know Ben-Shahar and Rubin and Seligman and Achor. But do you recall, the most famous happiness expert of all. Rudolph the self-smart reindeer, had a very high EQ. He knew how to manage his emotions, and was the self-proclaimed happiness guru. All of the other reindeer, wondered why he was filled with glee. They knew they had more than Rudolph, but couldn’t seem to find the happiness key. All of the other reindeer, gathered round to hear the news. Rudolph simply gave them one word, he told them that it was theirs to choose. Merry Christmas everyone! May you experience tremendous happiness and joy on this beautiful day.